WITI San Francisco Spring Fling Mixer! Founding Chairman, ParcPlace Systems, Inc.
Click Here for Details | Download the Press Release | Register Now! You can spend Invaluable time with top tiered executives from CISCO, McKESSON, GENENTECH, CHARLES SCHWAB, and many more at the Women in Technology Foundation's EXECUTIVE AUCTION! WITI is Committed to Creating New Possibilities for Your Future... Details! The Two Sides of "Why?" Huge savings on phones and accessories at the WITI Wireless Center! This month's specials include free BlackBerrys and waived activation fee on AT&T plans. Details. Join WITI @ The 2010 MIT Sloan CIO Symposium! This year's theme will focus on the role CIO's play to create a strategic value for your organization's mission via IT. • Look beyond the day to day issues to focus on a spectrum of solutions that are either already here or just over the horizon. • What can the CIO do now to plan for the coming recovery to position their organization for growth? • Hear from experts on our CEO, CIO, and Academic an other panels. • Network with your peers throughout the day. • See the Innovation Showcase of latest technologies and business processes. Special Offer: Use Promo Code WITI2010 and Save 15% Off Registration... Click Here for Details! Join WITI @ Best Practices In Healthcare Cost Containment! The economic hardships of today have left many hospitals and health systems across the country reeling-perplexed about how to continue to effectively deliver quality care while tackling the financial changes that ultimately impact their bottom line. At this event, attendees will gain valuable strategic tools and processes geared at program performance. Click Here for Details! 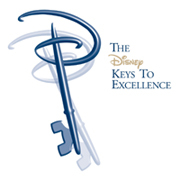 Early Bird pricing is available for Disney's upcoming events in Michigan... visit www.KeysLansing.com or www.KeysAnnArborMI.com for complete details! Disney's one-day local workshops offer a rare and affordable opportunity to learn best business practices from Disney insiders. Organizations from across the nation have learned proven philosophies and implemented effective processes to reap the rewards of improvements in leadership, management, service, and brand loyalty.